Our quiet location is close to all the fun, attractions and excitement of Fish Creek and Peninsula State Park. 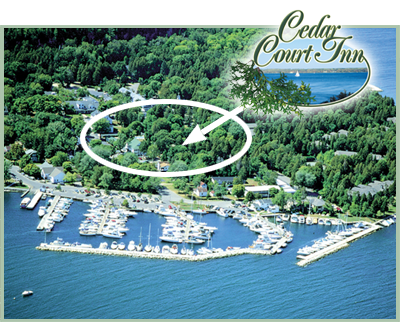 The Cedar Court office is located one block off Hwy 42 & one half block from the bay of Green Bay and houses our Motel, One and Two Room options (A) and is steps from the marina and beach. Our Townhouse Cottages (B – Creekside Cove & C – Brook Point) are located a few blocks down Hwy 42 and are in close proximity to Peninsula State Park.